For the past year I was on the core, agile team that regularly optimized the Buy page for all Autodesk product centers. Autodesk sells over 150+ types of software around the world. Our goal was to design a flexible, modular Buy Experience that could accommodate differing currencies, languages, and cultural design differences. Our improvement of the Buy page garnered massive attention from design peers, development teams and business advocates up through the VP level. The project was also an exercise in managing expectations up and down stream. The original Buy page simplified the previous shopping experience, but could not scale across the marketplaces globally. It quickly hit design restraints for localized promotions and design differences regional managers needed. The regional managers created one-off solutions to satisfy their immediate needs without adhering to brand standards, leading to broken, disjointed customer experiences. The variety of experiences weakened the Autodesk brand identity and increased confusion during the Buy experience. The agile team was handpicked to include a regional sales manager, development team, user researcher and two UX designers (including myself). Sprints would run about every 2 months followed up with 2-3 month testing cycles. Each sprint would address a different design issue of the Buy experience. We aimed to impact the Buy experience based on metric changes measured by click through time, page bounce rates, abandonment numbers and increased sales. During the past year we rolled out several sprints to address different design elements that impacted a customer’s understanding of the product offering and pricing options. Below were some hypotheticals we tested…. How can the Buy page design visually reflect the various one-time promotions and campaigns? What would happen if the monthly pricing option was not offered? How can the pricing options on the Buy page be re-designed to be more simple and easy to understand? Can the design also flex to the design needs to each region? 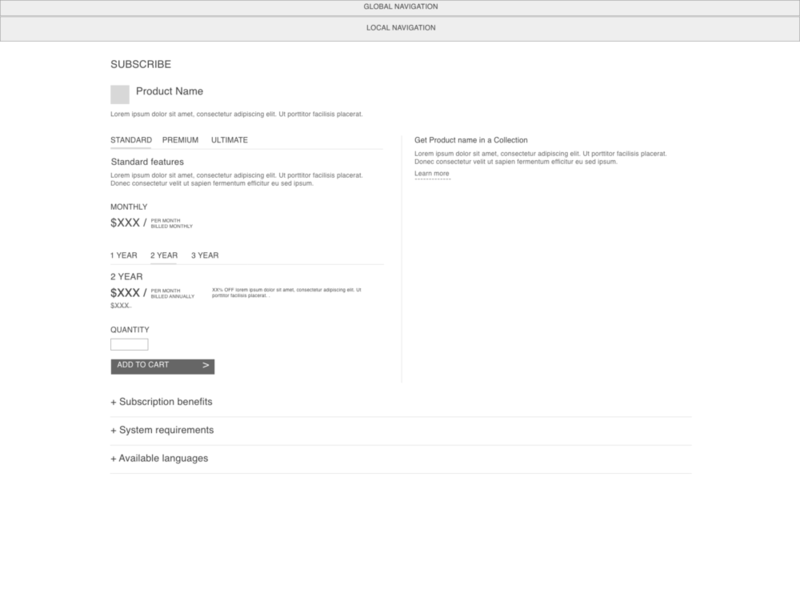 How can the Buy page introduce and suggest some of Autodesk’s software bundled offerings? How can the Buy page recommend better pricing options when a customer buys more than 2 products? What other ways can the pricing be broken down so a customer does not need to calculate the offer themselves? With each reiteration, we aimed to impact the Buy experience based on metric changes with click through time, page bounce rates, abandonment numbers and increased sales. For the past couple of years, Autodesk has been migrating its customers from one-time purchase to a cloud subscription financial model. The pricing options varied from 1 month, 1 year, 2 year, and 3 year plans. The Sales team was hoping to push the envelope further and wanted to get rid of the 1 month pricing altogether. To eliminate an entire pricing option raised concerns about potentially upsetting numbers of loyal customers. What would happen if the monthly pricing option was de-prioritized? The immediate design concern was to what degree should the monthly option be de-prioritized? The user experience could range from subtle to jolting. The largest risks were losing long-time customers familiar with current payment options or turning off potential customers who can only commit monthly. As the designer, I voiced the customers’ concerns and suggested that we explore alternatives to removing the monthly option altogether. Can the pricing simply be re-ordered? Can the default highlighted pricing option be another option other than 1 month? Can / should the 1 month option be taken off the page entirely? I believe that great design solutions often come together collaboratively, so I invited the stakeholders to collaborate on a wireframing exercise that considered how a customer understands and navigates pricing during the Buy experience coupled with what would / could impact that flow. I pitched several options that offered 3 different user experience flows and visual hierarchies. A large part of the process was clarifying the priorities of the various stakeholders, and identifying the workflows that achieved the best outcomes for everyone. In a testing environment, we tested one or two variables at a time while waiting for results every couple of months. It became increasingly clear to better the Buy experience it was an amalgamation of product information, pricing display, copy writing, visual hierarchy and sales promotions. All components were an individual lever that could be pulled to alter the Buy experience. Prior to changing one factor, all the other components had to be considered. Experimenting new designs on a page with high scrutiny came with the challenge of understanding and consolidating all the needs and desires of all the stakeholders. This project taught me how to navigate corporate strategy and nurture work relationships positively and effectively. It was an exercise in explaining design initiatives in a relatable and relevant format so non-design teams could understand. At times I pushed the current visual hierarchy with my own design team established to experiment and pioneer new standards. The goal was to be the voice of the customer always.